Traverse City’s downtown dining scene has earned a reputation as one of America’s hottest small-town dining destinations. Traverse Food & Wine Editor Tim Tebeau heads inside four standout restaurants to investigate some of the why. Anticipating the nightly in ux of July diners, kitchens in four square blocks of downtown Traverse City buzz with the motions of mise en place. At Bistro FouFou, the bright trinity of mirepoix—celery, carrots and leeks—are precisely diced and sweated into sauces and stocks while quartered rabbits and Pekin ducks, meltingly tender, are pulled from a long confit. Kitty-corner at The Towne Plaza cured pork bellies soak up the flavor of slow-burning maple chunks in a cast iron smoker, pork cheeks braise in the oven, and house-cured bresaola and mortadella are sliced for service. One block over at Red Ginger, electric-red tuna loins await the razor kiss of a deba blade, while soft-shell crabs are prepped for a hot tempura bath beside green hillocks of hot wasabi. A basket heavy with summer mushrooms comes through the kitchen door of The Cooks’ House where fresh pasta strands fall from the wires of a chitara, and wild watercress is rinsed for garnish. The condensed, thriving scene folds together classic French fare with West Indies flavors, New American nose-to-tail, contemporary East Asian haute cuisine and a 26-seat farm-to-fork food temple. With a collective résumé studded with Michelin stars and studies in cult-status kitchens on both coasts, Chefs Guillaume Hazaël-Massieux, Chris Hoffman, Dan Marsh, Erik Patterson and Jennifer Blakeslee interpret the abundance of our local farms and forests across a spectrum of flavor and style that have established Traverse City as one of the nation’s hippest small-town dining destinations. As summer light slides to a lower angle over the rooftops, each dining room is laid out with stemware and silver; eager service staff along with the metallic timbre and heady smells of the kitchen greet the first wave of diners through the door, and thus begins the evening. 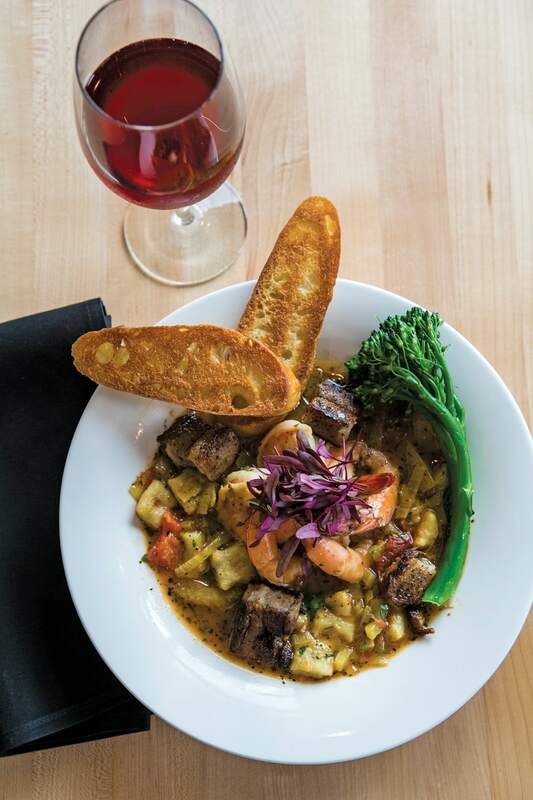 Join us as we dive into four kitchens at the core of downtown Traverse City’s dining scene to meet the chefs, suss the vibes and chow down on the signature dishes. Swankly urbane, Red Ginger’s stylized fixtures, bright red accents and busy cocktail lounge bring a big-city buzz to the Front Street Theater District. Svelte service staff clad in all black orbit the tables with brightly hued Lotus Flower martinis and Snap Dragon sushi rolls. Indie lounge tunes pump through the speakers, diners stack up at the door, and the whole restaurant hums with appetite. Red Ginger’s dining room staff practices progressive team service, ensuring a quick, friendly conduit of food and drink between kitchen, bar and guests, while articulating the nuances of spicy fermented soy bean paste or single origin sake and driving the hip, social atmosphere. 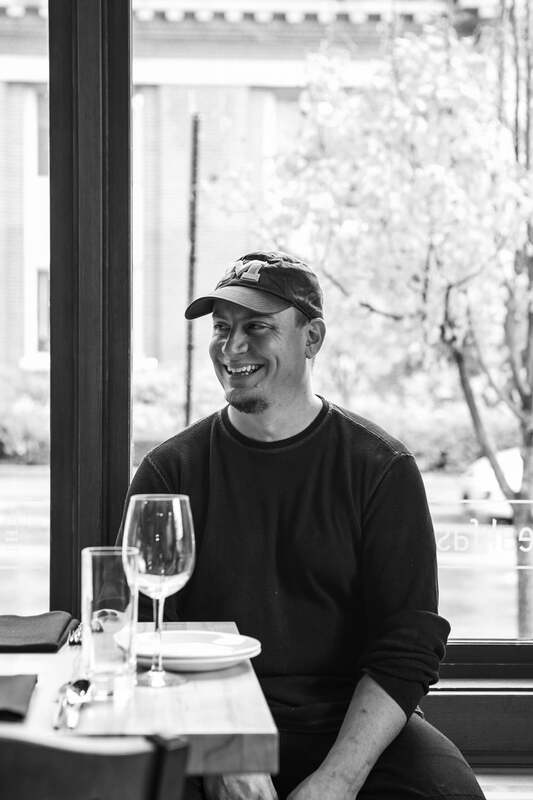 Graduating from the Culinary Institute of America in the early ’90s, Dan Marsh did a brief stage in New York City and left to chase the burgeoning haute Asian food scene in San Francisco at restaurants like Hawthorne Lane and China Moon. Marsh finally returned to Traverse City to launch Red Ginger in 2007. “I’m most drawn to the layers of flavor in Southeast Asian cooking,” Chef Dan explains, “exotic ingredients like lemongrass, kaffir lime, soy and galangal root create a fascinating interplay between the six elements of taste.” While Marsh works to preserve integrity and authenticity in his Korean, Thai, Chinese and Japanese preparations, he also likes the potential in fusing ingredients from the respective cuisines. Chef Dan’s massive dry storage is packed with 14 varieties of soy sauce and rare imported red chili and curry pastes, while his cooler is stocked with day boat tuna, snapper and halibut, which can make the journey from ocean to plate in less than 24 hours. Red Ginger’s menu plays on a modern pan-Asian flavor palette that incorporates Thai, Vietnamese, Chinese and Japanese influences. 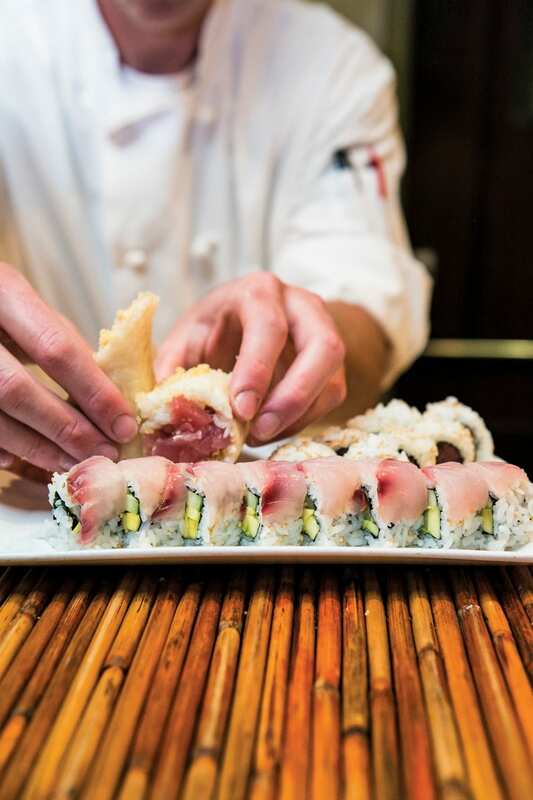 The sushi bar cranks out 20 signature rolls like the Tunagi with freshwater eel and ahi tuna or the Seoul-driven Spicy Surf and Turf with Bulgolgi flank steak and blue crab. Sustainable Pacific tuna, snapper and yellowtail arrive daily from Honolulu, and summer brings whole Alaskan halibut from small fisheries. The hot menu hosts creative starters like Chinese barbeque pork ribs and calamari with Kochujang vinaigrette and main plate of Thai green curry, umami-charged Japanese mushroom ramen or miso-glazed sea bass. The drink list is mostly bold West Coast wines, proprietary martinis and craft sakes. Thai Curry. Chicken and shrimp are simmered in coconut milk infused with an aromatically supercharged green curry paste of lemongrass, galangal, kaffir lime leaves and spices and served over jasmine rice along with roasted Japanese eggplant, white mushrooms and fresh bamboo shoots. With a smoky barbecue pit huffing along the back wall of its brick corner building, The Towne Plaza rocks with the same casual comfort echoed in its new American soul food. Natural light floods a dining room hung with arty local farm photos, and a shiny steel wrap-around bar borders the garde manger station and open kitchen, where diners can watch their pork belly travel from pan to plate. Summer brunch patrons bask in the sunlit plaza sipping on Spanish Cava or local bubbly between bites of fried chicken benedict—all set to an alt-rock soundtrack. 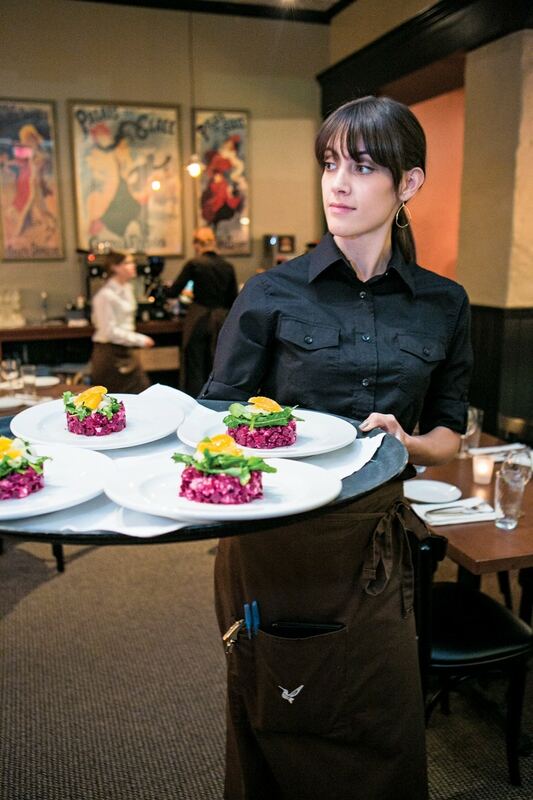 Averse to stiff etiquette, the friendly young service staff engage diners and share the local ingredients used to build Chef Hoffman’s daily specials. 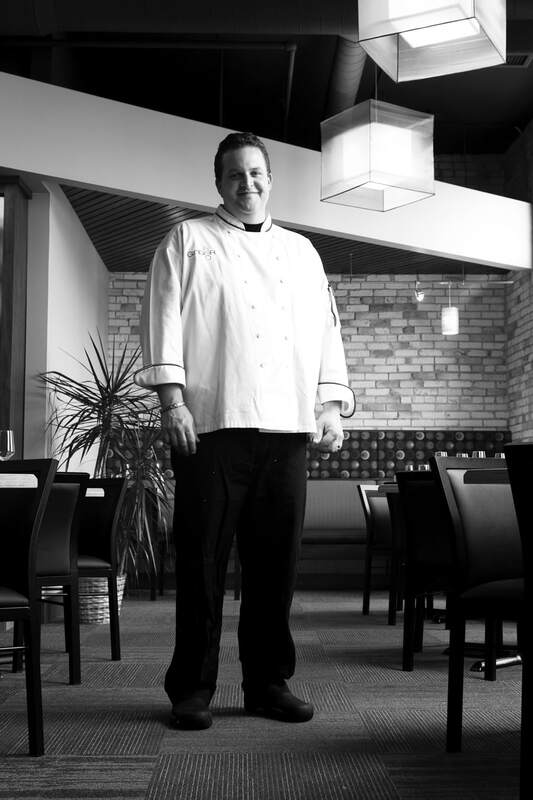 Originally educated as an architect, Chef Chris Hoffman answered the siren song of the culinary world, training at the Great Lakes Culinary Institute and serving as Executive Chef at Leland’s Riverside Inn before launching The Towne Plaza in 2012. “It’s about my entire life,” Hoffman explains, referring to the diverse influences that make up his menu, “taking all the places I’ve traveled that have moved me from a culinary standpoint: San Antonio, New Orleans, Charleston, Italy and France and bringing them together with pigs and vegetables.” A self-proclaimed porcophile, Hoffman purchases whole hogs from Michigan farmers and reinvents them in everything from charcuterie to Low Country barbecue. Starving foodies can get their pig fix three times a day at The Towne Plaza, as breakfast service begins at 9:30 a.m., and dinner runs well into the evening. Morning and midday features smoked salmon cakes with poached eggs, hollandaise and butter bibb, porchetta with fries and chimichurri, local tomatoes stuffed with chèvre, pancetta and spinach or a sampling of housemade charcuterie. Dinner offers a larger array of terrestrial proteins like marrow bones, roasted quail and ostrich with caramelized onion jus as well as coastal shellfish and fresh pastas. Local farms like Werp and Norconk supply the fresh seasonal produce that spans the menu, and on the libations side, The Towne Plaza offers a concise but thoughtful list built around Michigan microbrews, craft spirits and a mix of local and international vino. Surf & Turf. Chef Hoffman’s late-morning soul-food rendition of an American classic. Fried oysters, crispy pork belly, poached eggs, cornbread and butter bibb. A perfect marriage of aquatic and terrestrial delight. The eponymous retrofitted address on Wellington Street speaks to the inspired minimalism of farm-to-fork cuisine that has established The Cooks’ House as one of the Midwest’s cultiest eateries. The white, well-lit, 26-seat dining room is hung with modern paintings from local artists, and tables are set with white linens and quality crystal, but the restaurant emphasizes a comfortable come-as-you-are approach to enlightened local eating. (The dress code is simply “clothes.”) The Cooks’ House retains a high staff-to-guest ratio so that diners are never wanting for comfort, and atmosphere is relaxed and social with tables trading conversation. 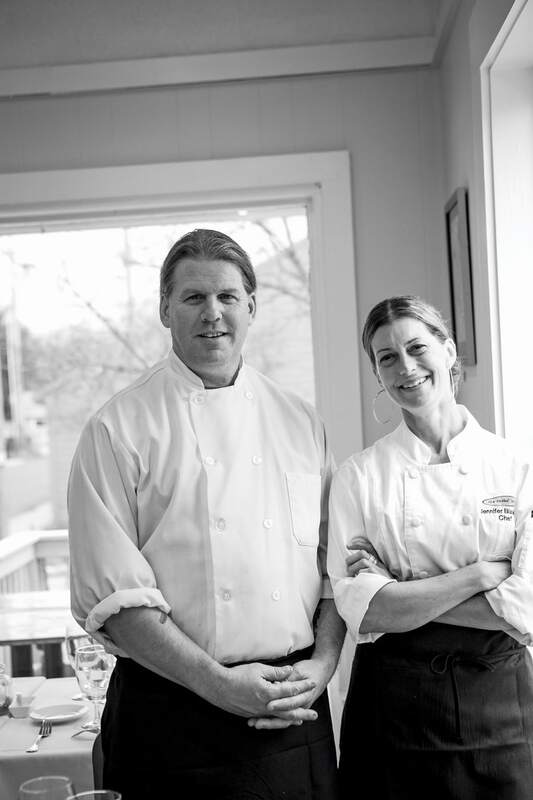 Patterson and Blakeslee worked together in Las Vegas, where they had been cooking in Michelin-starred kitchens, namely under iconic French chef André Rochat and hatched an idea to open a small restaurant in Blakeslee’s native Traverse City built on the bounty of locally grown and foraged foods. “We take most of our focus from the actual ingredients themselves,” Patterson explains. “My food is a bit simpler, whereas Jen likes to work with more complex flavors from her travels in India, Mexico and Southeast Asia.” Patterson and Blakeslee supplement their busy year-round dinner service with cooking classes that explore regional cuisines and improvised seasonal cooking from local farmers markets. Ingredient-driven, The Cooks’ House menu follows the seasonal arc of farmed and wild ingredients, changing when necessary to accommodate a basket of fresh hop shoots, hen of the woods mushrooms or sugar snap peas. Starters could be crispy pigtails or roasted rabbit with honey, hops and steel-cut oats or fresh asparagus soup. 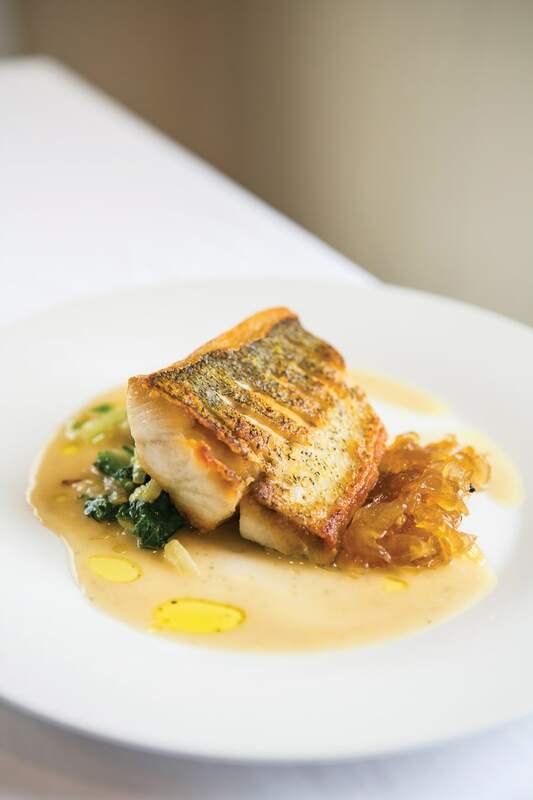 Entrees may range from grass-fed strip steak with bone marrow mashed potatoes to walleye over fennel and sweet onion purée. High summer brings a bounty of heirloom tomatoes from nearby farms, which lend sweetness, color and acidity to Jen and Eric’s creations. Five- and seven-course tasting menus are always available for those seeking a small plate survey of what’s in season, and the wine list is driven by local and international artisan bottlings. Asparagus Soup. Keeping with the household religion of high quality ingredients and minimal manipulation, Norconk Farms asparagus is blanched in salt water, pureed, seasoned with salt and garnished with extra virgin olive oil and wild mushrooms, just-picked. Simple and perfect. Explosion of asparagus. FouFou thrums with the essential bistro cacophony of popping corks, clinking crystal and lively conversation. The halo of stools surrounding the shiny zinc bar hosts happy-hour socialites sipping pastis and slurping oysters. Radial two-tops tables tightly spaced along an upholstered bench down the center of the dining room feed a collective energy fueled by braised rabbit and cru Beaujolais. Chef Guillaume calls it “a place to lower your inhibitions that’s alive with delicious fare, good wine and people talking to each other.” The service is attentive but not intrusive. If asked they’ll explain the local genesis of the Caribbean-style goat curry or the components of a French 75, but otherwise they slip into the ambient energy and let you get down to the business of eating and drinking. 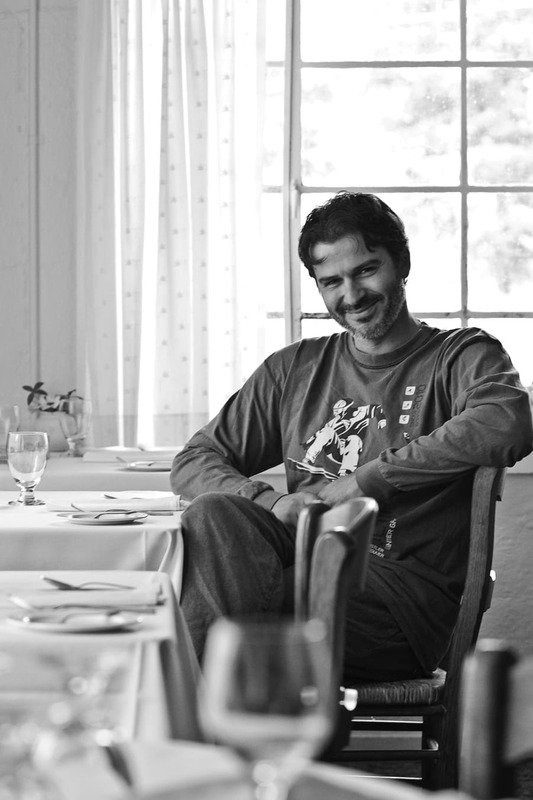 FouFou’s menu holds to the old school bistro aesthetic of artful peasant food paired with democratic wines. You’ll find several varieties of cold-water oysters and mineral-driven Reuilly from the Loire Valley by the glass. Start the meal with iconic hors d’oeuvres like sardines on toast with rouille and sauce verte, beef tartare or pork rillette before tucking into grilled ratatouille with Israeli couscous, duck confit with macaroni gratin or braised goat over lentils. The value-priced, Franco-centric wine list, supplemented with local vino and a few West Coast bottlings, is driven by small grower producers from some of France’s most intriguing appellations. You’ll find Chinon blanc and Provençal rosés, petit chateau Bordeaux or spicy southern Rhônes available by the glass and bottle. Sweeten the afterglow with chocolate pot de crème, pain perdu from local brioche or a cheese plate with compote. Steak Frites. This mouthwatering bistro mainstay could have been beamed straight from Paris’s Left Bank. A liberally seasoned chuck tender, grilled as you like it, embellished with a sauce of red peppercorns, demi-glace, cognac and cream and nested beside a mound of fresh-cut double-blanched fries with housemade aioli. This article is featured in the July 2013 issue of Traverse, Northern Michigan’s Magazine.